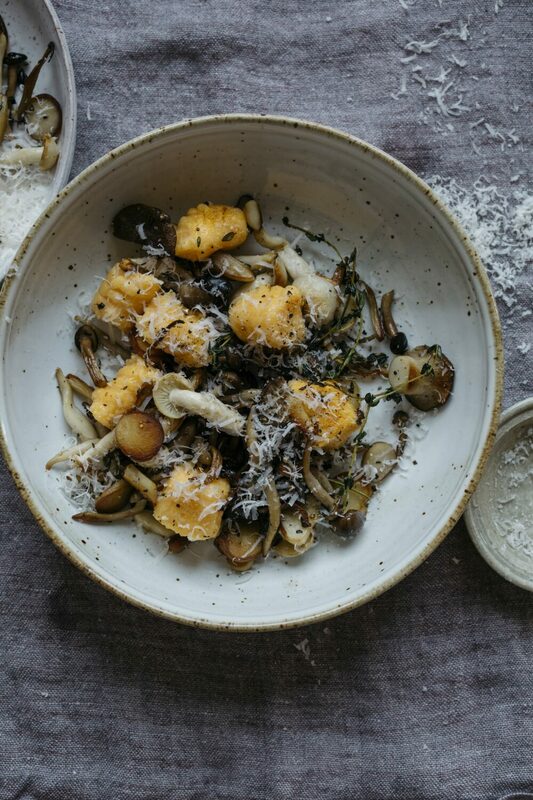 If you miss gnocchi, you’ll love this addictive vegetarian combo of gluten free dumplings tangled with perfectly seasoned sautéed mushrooms. The gluten free gnudi is sure to become a favorite. If your ricotta is watery, drain it briefly in a paper-towel lined strainer before using it. Line a baking sheet with parchment paper. In a bowl, combine the squash puree, ricotta, egg, Parmesan, nutmeg, potato starch, and 1 teaspoon salt and mix until it comes together into wet dough. Dust a clean surface with potato starch. Cut the dough into four equal pieces, roll each piece into a log about 1 inch in diameter, kneading and squeezing the dough to help it hold together. If the dough is too sticky and crumbly, knead in more potato starch. Cut each log into bite-size gnudi. Set the gnudi aside on the prepared baking sheet. Bring a large pot of water to a boil. While the water heats, cook the mushrooms: In a large sauté pan over medium-high heat, warm the oil. Stir in the garlic, mushrooms, thyme, 1/2 teaspoon salt, and 1/4 teaspoon pepper and cook, stirring occasionally, until the mushrooms are tender and golden, 6 to 8 minutes. Season the boiling water with 1 tablespoon salt. Working in three batches to avoid overcrowding, add the gnudi to the pot. When the gnudi rise to the surface, cook 1 minute longer. With a slotted spoon, transfer the gnudi to the pan with the mushrooms and toss. Repeat until all of the gnudi are cooked, adding up to 1/4 cup of the cooking water to the mushrooms if dry. Garnish with Parmesan and serve immediately.